An illustration shows the planet Kepler-186f, one of many new worlds found by the Kepler space telescope. The Kepler spacecraft continues to pump out piles of exoplanets, helping astronomers explore whether we are alone in the universe. By now, it’s no secret that the sky is swarming with planets, and as NASA’s Kepler spacecraft continues to cast its net into the cosmic ocean, it’s reeling in alien worlds faster than any other planet hunter in history. 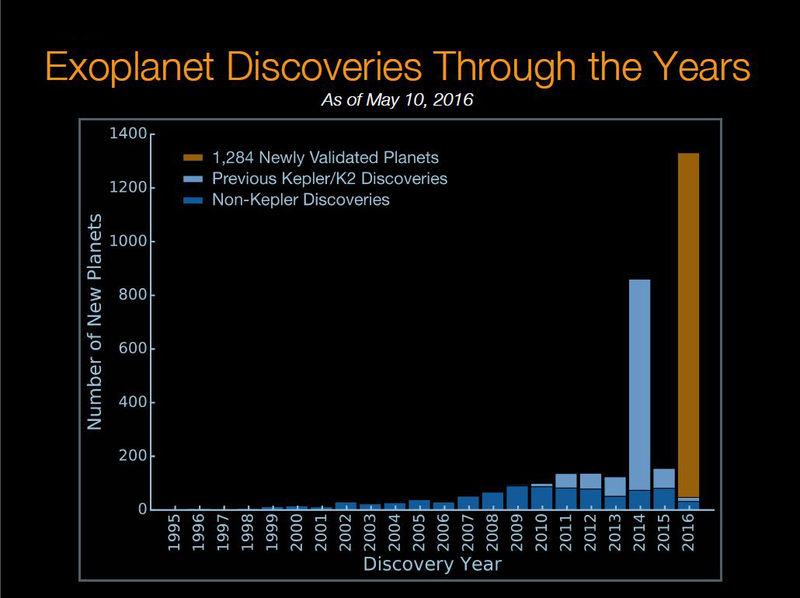 Today, Kepler scientists announced that we can add 1,284 new exoplanets to the list of confirmed worlds. The haul boosts the Kepler mission’s total to 2,325 discovered exoworlds, which accounts for more than two-thirds of the known planets in the galaxy. These new planets include roughly 550 worlds that could be rocky like Earth, and nine of these orbit within their star’s habitable zones, or the region where liquid water can persist on a planet’s surface. Some of these planets are potentially similar to the closest Earth-analogues discovered so far, known as Kepler 186f and Kepler 452b. Scientists found the latest batch of exoplanets using a new automated technique, developed by Morton and described today in The Astrophysical Journal, that sorts through the piles of data from the Kepler spacecraft. Without this kind of statistics-based automation, finding and confirming the presence of exoworlds is intensely time consuming and requires follow-up observations to weed out imposters that might masquerade as planets. It was just 20 years ago that the first exoplanet, a large world about the size of Jupiter, was found orbiting a star similar to the sun. Before that, many scientists weren’t sure we’d ever find a planet outside the solar system—let alone thousands of them, most of them discovered within the last two years. Kepler made the search for other worlds significantly easier when it launched in 2009. For four years, the spacecraft stared at a small, glittering patch of sky just above the plane of the Milky Way. From its perch in space, the telescope watched with unrivaled precision as planets marched across the faces of more than 150,000 stars, briefly dimming the distant stars’ light. From those twinkles, scientists could determine how large the faraway planets were, how many circled a given star, and how long it took the planets to orbit once around their suns. But that patch of sky is only a fraction of what’s out there, and for Kepler to see a planet, it needs to be aligned just right with respect to the telescope. Extrapolating from the Kepler results, Batalha says the Milky Way is likely loaded with planets that could be very much like Earth. Batalha notes that scientists are still working out just how common Earths could be. For now, it appears as though maybe 25 percent of small red stars called M dwarfs could host something vaguely Earthy. That number could be a bit lower when larger, hotter stars are considered. But the data haven’t been completely analyzed yet, and Batalha says to expect a more refined estimate in 2017. The latest haul comes from data Kepler collected when it was still in its original operating mode. In 2013, the spacecraft lost the second of its four reaction wheels and couldn’t maintain its precision stare. But instead of ending the mission, scientists figured out how to use the sun’s light to help aim the spacecraft and re-tasked it with studying more than just its original patch of stars. Since then, the K2 mission has bagged dozens of planets and expanded its horizons to include observations of supernovas, rogue worlds that wander the galaxy without home stars, and even planets much closer to home, such as Neptune. And the spacecraft is proving to be exceptionally hardy: A few weeks ago, the venerable planet-hunter recovered from another near mission-ending malfunction and is back on its feet. “Everything is looking good with the spacecraft,” says mission manager Charlie Sobeck. With Kepler’s keen eye pointed at the sky for another couple of years, plus the upcoming array of planned ground- and space-based observatories, it seems likely our view of the cosmos is going to continue changing dramatically.